Heaps of markets on this weekend in Tokyo, and while I'm still tromping about the wilds of the Midwest I just know there are vegetables I'm missing. I've already been craving daikon and our house salad, even though a recent hearty serving of roast parsnips, beets, brussel sprouts, potatoes, and garlic gave me a fair amount of comfort. Head on out and grab some extra mochi with a glorious bunch of komatsuna for me! 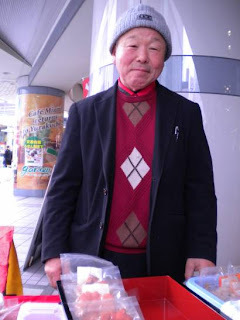 Photo Note: Another producer from the Yurakucho Farmer's Market. The weekend we went featured Akita Prefecture foods and those who make them possible. This lovely gentleman let me sample and then sold me one of the more unique items I've tasted yet: smoked daikon. Absolutely killer flavor with a nice bit of crunch to make an unexpected pickle-type treat that I've not tasted the like of ever before. You made me miss all those delicious things as well. Our family had a get together last night and ate mainly "Japanese" fare- but there were so many things we missed out on....uwajimaya - although a great store here, just doesn't compete with a great farmer's market! Daikon - is it what I know as Mooli or winter radish? It might be, VP. Daikon in Japan is really just daikon, but sometimes in other countries it's called a large white radish. Kitazawa Seed Company and Johnny's offer some similar-sized varieties, too. Do you have pictures of the one you're talking about? Green Leaders Back on the Calendar!